Last year’s panel will judge this year’s chili as well. 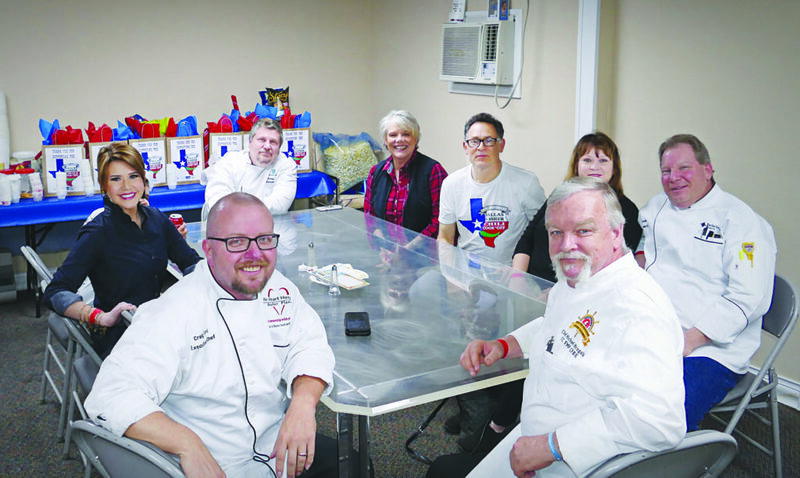 The chief chili cook-off committee is finalizing plans for Tiferet Israel’s 26th Annual Kosher Chili Cook-off set for Sunday, March 31, on the synagogue’s campus, 10909 Hillcrest Road near Royal Lane. Gates open at 11 a.m., rain or shine. This year’s event has some exciting new features in addition to some of the tried and true favorites for all ages. Musical entertainment will be provided by three bands. The Side Gig Band plays a broad spectrum of Pop and Rock from the ‘70s to NOW — from Clapton, Green Day, Queen and The Doobies to Jon Mayer and Ed Sheeran. Ron Nevelow, Bruce Katz, Ron Friedman, Rob Shrell, Rusty Cooper and Joel Futterman will entertain and open the music for this year’s Dallas Kosher Chili Cook-off with style! The Mazik Experience was created to continue the Mazik Brothers Band’s 14-year run playing at Tiferet’s Dallas Kosher Chili Cook-off, and their legacy as the “sound of the Dallas Kosher Chili Cook-off.” After the loss in 2018 of its leader, Jim Schwartz, the remaining Mazik Bros., Rusty Cooper, Rob Shrell and Joel Futterman, waited for the right musician/friend and opportunity to present itself. They asked Eric Spomer, a talented musician and performer for 40 years, to step into the role of singer and guitar player with Rusty to honor the heritage of Jim Schwartz and the Mazik Brothers along with its many fans. Playing mainly ‘60s and ‘70s classic pop and rock, attendees are likely to know and sing along with everything they play: Beatles, Eagles, Billy Joel, Rolling Stones, Springsteen and more. This will be the 15th year that the original band members perform at Dallas Kosher Chili Cook-off! While this will be Windy City’s first appearance at the Chili Cook-off, David Judson, Jim Rosenthal and Bob Rosen are no strangers to the event, having made prior appearances with the Mazik Brothers over the years. David, Jim and Bob have played together in various bands and configurations over the past 15 years. Common to all of their pasts was that they each had played in “horn” bands when they were younger. The three started discussing how great it would be to play the music of Chicago. After they played together, they began the search for other members. They added trombonist John Williams and keyboards, trumpet, saxophone, a vocalist (to sing the Robert Lamm/ Terry Kath parts) and, most recently, Ken Eger to sing the extremely-difficult Peter Cetera parts. While the music has been a central feature of the cook-off for many years, there is something for everyone. In conjunction with this year’s event, the Recovery Resource Council, which recently merged with The Council on Alcohol & Drugs, will hold a Drug Takeback. This will be a great opportunity to gather up expired, unused, and unwanted prescription or over-the-counter medications (human and animal) for safe and proper disposal. The drop-off event helps to keep these types of drugs out of the water supply and from being used by unauthorized users. Medications can be dropped off in their original containers or — with the exception of liquids — in a plastic baggie. All of the medications dropped off will immediately be placed into a container and, at the end of the event, taken directly to the Drug Enforcement Agency to be destroyed. Please note, needles (any sharps) or inhalers (any combustibles) will not be accepted at this event. However, needles and EpiPens can be placed in a plastic container (such as a detergent or milk bottle); tape the lid securely, and write the word “needles” or “sharps” on the container and then place it in your normal trash bin. David Feder and his family have been a part of Tiferet Israel for 55 years. He’s been involved in the food business in one form or another for half of that time, having been a noted chef in Dallas and Austin, a food writer (including for The Dallas Morning News and The Dallas Times-Herald). Later he taught food science and nutrition at UT Austin before becoming a full-time journalist. Now residing in the Midwest, he has worked for a number of magazines, including Better Homes and Gardens, LightStyle and First, and also wrote “The Skinny Carbs Diet Book” (Rodale Press, 2010). Chef Mike has been in the industry for over 43 years and has worked for the Olive Garden for over 14 years. He runs the entire kitchen operation at the restaurant on Northwest Highway. He is a member of the American Culinary Federation, Texas Chefs Association and a FMP from the National Restaurant Association, CFBE from the American Hotel and Lodging Association along with being a Certified ServSafe Instructor & Registered Servsafe Examination Proctor and a National Registry of Food Safety Professionals Test Administrator/Proctor. He teaches culinary arts at Tarrant County College. A native of Texas, Chef Pete is the Chef Owner of Chef Pete Catering and Ice Carving in Dallas and has worked in the best of Dallas restaurants and hotels for many years such as Hyatt Regency Hotel DFW, The Four Seasons Hotel, Sambucca Jazz Café, The Italian Club of Dallas and more. Chef Pete is also an artist and has received many awards and accolades for his ice pieces and his teachings of the art of ice carving. The director of the Dallas Chapter Texas Chef Association, he is a member of the Epicurean World Master Chef Society. Chef Pete was awarded the Best Caterer in Addison, Texas, in 2013. He has traveled with the Epicurean World Master Chef Society to Limerick, Ireland, and won the gold medal in healthy food competition. Native Texan, Kim Schroeder has been in the food service industry her entire career. She worked at the Dallas Market Center as a director for 10 years and has been the Retail Food Service associate director at the University of North Texas for the past 14 years. Kim is happily married for 19 years with one daughter. When not working, Kim likes to travel and host parities. Tom was born in Connecticut, but moved to Texas as soon as he could. He has been an executive chef for 34 years. A Johnson & Wales University graduate, he opened the OPUS restaurant at the Meyerson Symphony Center in 1993; then, was the chef at the World Trade Center, Dallas, for 15 years. He is the senior executive chef for the Baylor Scott & White Healthcare System. Winners for the cook-off beef (First, Second and Third) and veggie (First) categories are announced in the late afternoon. There is also a People’s Choice category that all attendees can participate in choosing their favorite chili. Simply cast your vote at the booth of your choice by placing your token in the team’s ballot box. Each paid admission includes a single ballot for the People’s Choice award. Recommended parking is at the Jewish Community Center, which is five minutes away. Free shuttle buses will be in place for the entire event. There is also local parking in the neighborhood. Admission is $12 for adults and $6 for children 4 to 10 which includes a free hot dog. Children 3 and under are free. For more information, visit http://kosherchilicookoff.us/.